If you haven’t upgraded to a mobile CMMS yet, what are you waiting for? These days mobile technology is more stable and cost effective than ever before. Organizations that had been reluctant to equip their maintenance technicians with mobile devices are now moving forward and deploying them due to their low cost and ease of use in the field. 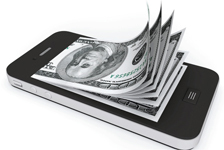 The reasons to use a mobile CMMS tool outweigh the small upfront costs of purchasing the technology needed to use one. Asset management and QR codes: Having an asset’s entire maintenance history available instantly helps with assigning jobs, or assessing potential issues. Quick Response or QR codes provide a tool to scan an asset’s code, bringing up its entire history–including preventive maintenance, malfunctions, reactive maintenance, etc. In a recent article by Facility Maintenance Decisions one organization calculated the cost savings of going with a mobile CMMS to equal as much as $125,000/year due the their minimized paperwork processing and lessened travel related costs. How much could your organization save? Contact our sales team today about Maintenance Connection’s mobile CMMS tool, MC Express.